THE PEOPLE OF MY SON WHOM I RECEIVED IT AT THE FOOT OF THE CROSS OF GLORY. Beloved children, do not forget that conversion draws Divine Mercy towards you; do not be amongst those who, having ears, do not listen and having eyes, do not see (Cf. Mark 8:18). PRIDE IS A BAD COUNSELOR FOR MAN, it causes him to forget that he is a finite creature and is therefore vulnerable to changing his ideas in the blink of an eye. Therefore, you must pray at all instants that your faith does not diminish, but be firm, and that you do not dare to deny My Son under the threats of those who surround you and are not believers. You are part of this generation that is betraying My Son, you are part of this generation, but you are not the creators of everything that exists, and it seems that you have forgotten this … ONLY GOD GOVERNS AND CREATES. You are bearers of the human ego, and with the human ego persevering in this identity that you have given to it, indulging your whims and refusing to sacrifice yourselves so that it no longer rebel against My Son, you fall into serious errors. Conscience grows and possesses the true sense for which it has been created, which is to be the voice that constantly calls you not to betray the Divine Love, but to keep it latent and constantly growing. The fulfilment of the Law of God is a requirement for My children and more so in these instants when it seems that good is bad and bad is good. Do not be confused, and stay alert so that you do not offend My Son. and you are constructing the future according to how you live the present, although you can change it for the good of the soul. GO THROUGH THE PAST WITH YOUR MEMORY SO THAT OLD OBSTACLES DO NOT CONTINUE BEING THE SAME ONES AS NOW. At this instant you are being alerted by the intuition that has awakened in your spirit and warns you so that you do not fall easily. Children, consider that you cannot continue prolonging the instant as long as you would like. My Son is constantly calling you by one means or another so that you are true fulfillers of the Divine Will and not refuse to attract Divine Grace at the present instant, and so that you live in peace, unity and fraternity. In this way the future will not be a constant wait that weakens you. The present instant is an instant in which the spiritual soul works and acts in the likeness of My Son. Everyone should be a blessing to their brother and not a cause for stumbling. On this path there are more thorns than roses, and walking on thorns is not pleasant. Therefore, I beseech you to love one another so that you are not thorns on which My children, called to warn you, have to walk and which make the road harder for them. For My true instruments it is not easy, since the one who “announces and denounces” at all instants is under the magnifying glass of others, but those who believe that they are the magnifying glass under which everything must pass, could not bear for an instant to surrender everything to My Son, surrendering every instant, every thought, every act or work. My instruments are not saints, they are creatures like you who struggle at all instants to persevere. You must not wait without being active, since it is by works that you will be recognized as children of God (cf. Rom 2,6, I Cor 3,13). Do not spend your lives without being active, since action keeps what you define as “time” consciously within the soul, and you will appreciate every instant, helping yourselves to keep attached to fulfilling the Divine Will. You know that you are going against the current of the world and this is a sign that you are well-directed. LIVE IN THE TRUE FREEDOM OF GOD’S CHILDREN (Gal. 5,1), otherwise you would not be working or acting outside the Divine Will, which is why you have fallen into sin, because God gives you the Gift of freedom, but to My Son’s pain, you have turned it into a terrible act of debauchery, coupled with the pleasures that satan has grafted into Humanity, in order to keep you from possessing the Heavenly Goods. DO NOT STAY FAR FROM MY SON, RECEIVE THE DIVINE MERCY AND DRAW NEAR TO POSSESS THE GIFT OF GRACE THAT KEEPS YOUR FAITH ACTIVE. In daily living you must be conscious of the Gift of Grace so that you do not lose it by a whim or an undue word, or an evil desire against your brother or sister. Do not forget that, as children of God, you have the freedom to act and work within the good and to be creatures that attract good towards your fellow men. 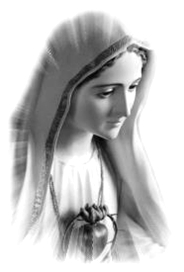 Beloved children of My Immaculate Heart, be creatures of good, do not walk being accomplices of evil, hold fast to the Teachings of My Son and do not accept what the devil places in front of you, telling you that it is good when you know that it is not good. Earth has taken the evil that man has unloaded upon it and is saturated; being man’s home, you have destroyed it and deformed it. Therefore you will suffer the unpredictable consequences for man of everything that is approaching for Humanity. Do not allow sin to lead you to take a harder path and prevent you from being more of My Son. My Son’s Church is constantly suffering for her faith; continue being creatures of faith, even in the midst of the great suffering and great confusion which will come to the Mystical Body of My Son. Remain immovable! Man has deformed part of science, and that science is in constant competition among the great powers, and this goes unnoticed by you. Terrorism, born of the desire for revenge, is working against My Son’s children, the innocent and the most defenceless. This is how evil works. The geography of the Earth is changing: water emerges in central areas and lashes coastal areas. Beloved children of My Immaculate Heart, embrace Divine Mercy and sin no more, be creatures of good. Do not continue using freedom in order to sin, but for living in union with My Son (cf. I Pet 2,14, Gal 5,13). What the world gives you is momentary; My Son offers you Eternal Life. I LOVE YOU WITH ETERNAL LOVE, I BLESS YOU WITH THE OIL OF MY LOVE. COME, TAKE MY HAND IN A FREE AND CONSCIOUS ACT: I INTERCEDE FOR YOU. Our Mother asks us to give Her our hand in complete freedom, not because She takes the place of God, but since God is the author of Salvation, we must ask: who had the author of Salvation in Her Womb? Our Mother showed me a mountain too high and extensive for me to see where it ended. On the top of the mountain I saw Christ, He was seated and could almost not be seen because of the people around him. But every creature, to reach the summit, had to overcome all kinds of obstacles. I saw people who wanted to force those who were climbing to descend. And in the midst of those creatures who did not want people to reach the top, there was Our Mother, working hard to take Her children, those who voluntarily wanted to climb, out of the hands of those who were preventing their climb to the top of the Mountain. Our Mother was helping them, She did not take them to the top of the Mountain. I saw how many creatures were growing tired, they were ashamed to be seen almost exhausted, and they were taking nearby paths where they were being offered comfort. CHILDREN, DO NOT STOP, CARRY ON, FOR THE KINGDOM OF MY SON IS NEAR! (cf Mt 3,2).